Slumped in a the corner of an expansive British churchyard is the grave of Hannah Twynnoy, a 16th century barmaid who is said to have been the first person in Britain's history to be killed by a tiger. While this poetic account does not prove Twynnoy's cause of death, there is also a well-known local story about the woman's demise. As the legend goes, Twynnoy was a barmaid in Malmesbury when a traveling menagerie set up shop in the expansive rear yard, bringing with them a full grown tiger which the waitress soon took to taunting in her free time. Unfortunately the tiger managed to escape and went right for the barmaid, mauling her to death before it was recaptured. At one time there was even a plaque explaining the story, but it was lost over the centuries. 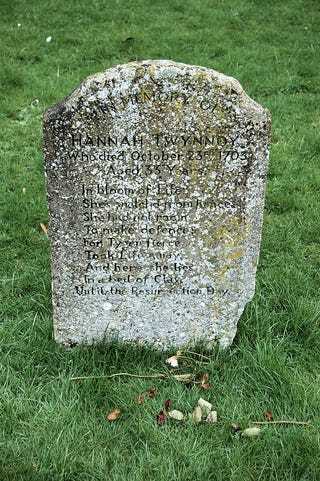 The grave gives Twynnoy's death date as October 1703, making her death the earliest reported case of a tiger killing a human in British history. In 2003, to commemorate the pioneering death, all of the local girls with the name Hannah visited the grave and left flowers. None of them seem to have had such trouble with exotic animals.